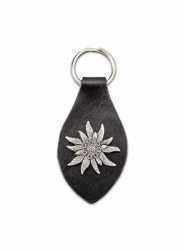 Leather tear drop key rings with an Edelweiss flower attached. 4” long. Swiss Key Ring - Belt Loop Strap. Stainless with two key rings attached to a black leather belt loop strap. Both key rings are removable. 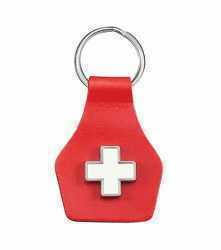 Enameled Swiss Flag attached to strap. 4” long. 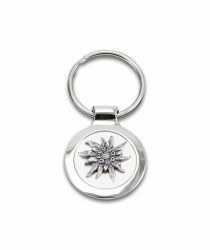 Metal Edelweiss medallion key ring. 1-3/8” diameter 2.5” long. 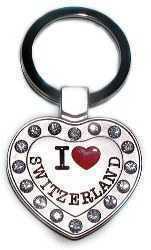 White metal bell on strap - bell has Alpine flowers, Swiss shield, Switzerland, strap has ?Switzerland? 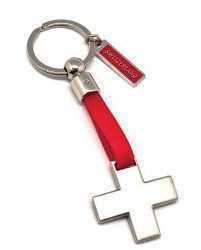 and a Swiss Cross on strap end. 5? long. 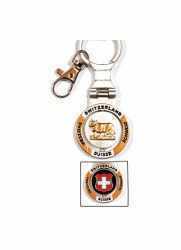 Metal key ring with cow and Swiss shield on 2-sided center. 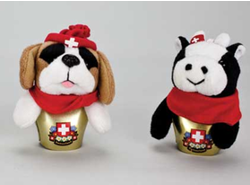 “Suisse, Schweiz, and Switzerland” around edge. 4” long. Wilhelm Tell, son and red apple metallic key ring on chain. 4.25 inches long. 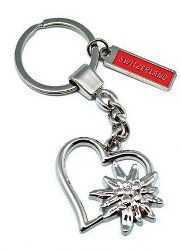 Heart key ring with small cut stones around the edge, and I (heart) Switzerland in the center.